The first thing to note is that this product is not merely a foodstuff, as such, but is also supposed to have medicinal value. 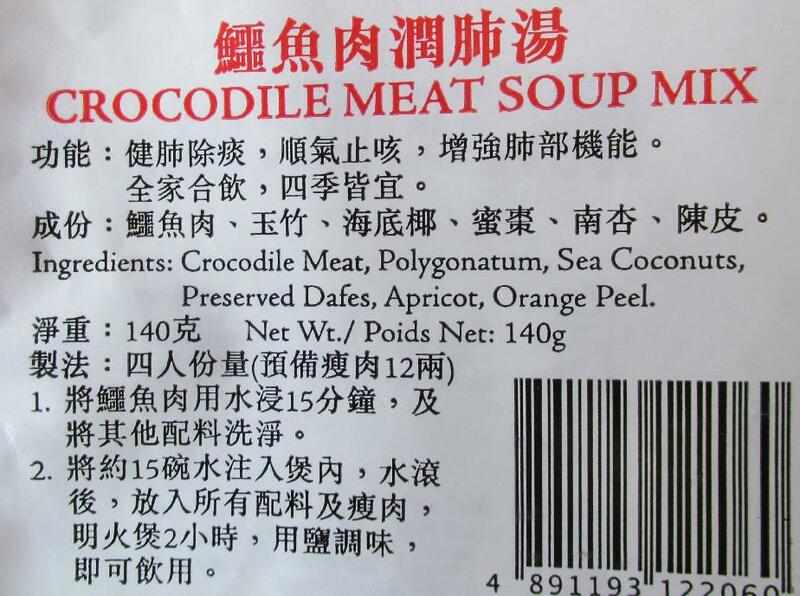 The Chinese text immediately below the words ‘Crocodile Meat Soup Mix’ list the ‘Function’ of the soup and we are told that the whole family can drink this all year round to preserve good ‘lung region’ health. The actual text is a little more detailed this and makes specific reference to ‘phlegm’ and so forth, but suffice it to say, it is touted as being good for whatever may ail you in the breathing department. 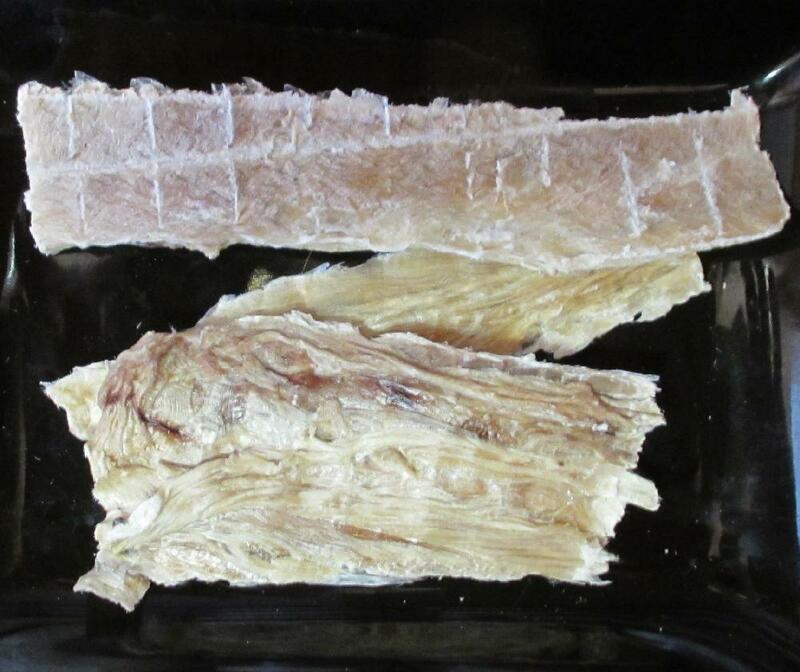 Crocodile Meat: The Chinese characters for this ingredient are鱷魚肉. The third character simply means flesh, or meat, but the other two can mean either crocodile or alligator. It is impossible to tell just by looking which animal this is actually from but, since the product is from Hong Kong, I suspect it is, in fact, crocodile. The consistency of it no different than any jerky (you can see the marks from the drying racks as with other jerkies) and the aroma is very much like that of dried squid. Polygonatum: The Chinese name for this, 玉竹, translates as ‘jade bamboo, but the more common name in English is ‘Solomon’s seal’. 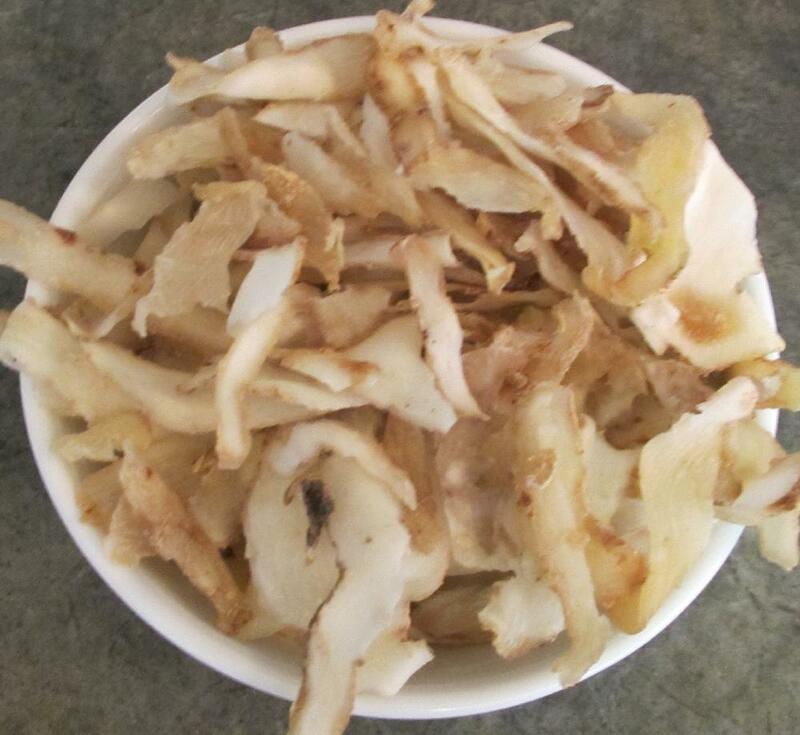 It comes from a plant in the lily family and the part is eaten is the dried rhizome. There are lots of soup recipes on the Internet using this ingredient and a number of these sites do mention that it is to be used for pulmonary function, especially in cases where there is dry, sticky phlegm. When tasted in the dry state it is very like wafers of semi-dry coconut flesh. 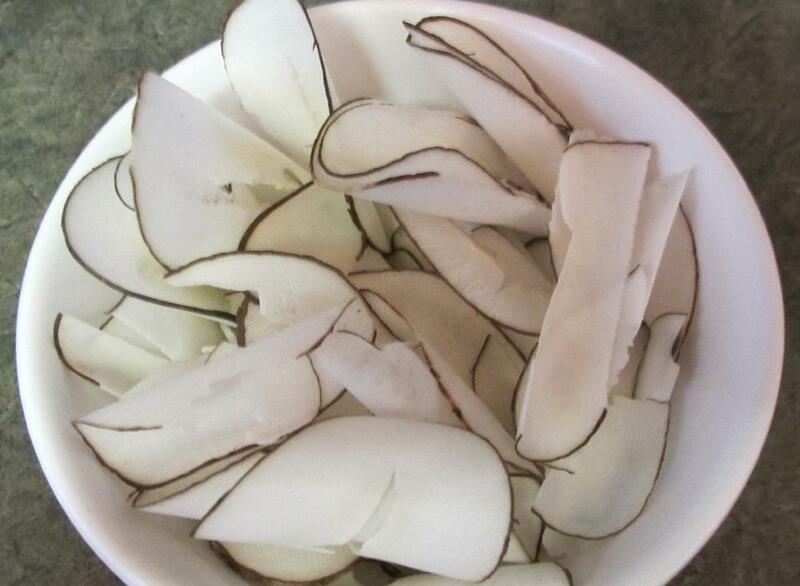 Sea coconut: Although there is a type of African coconut called the ‘sea coconut, the ingredient you see pictured here is the dried, sliced fruit of the sugar palm that grows in South-east Asia,. 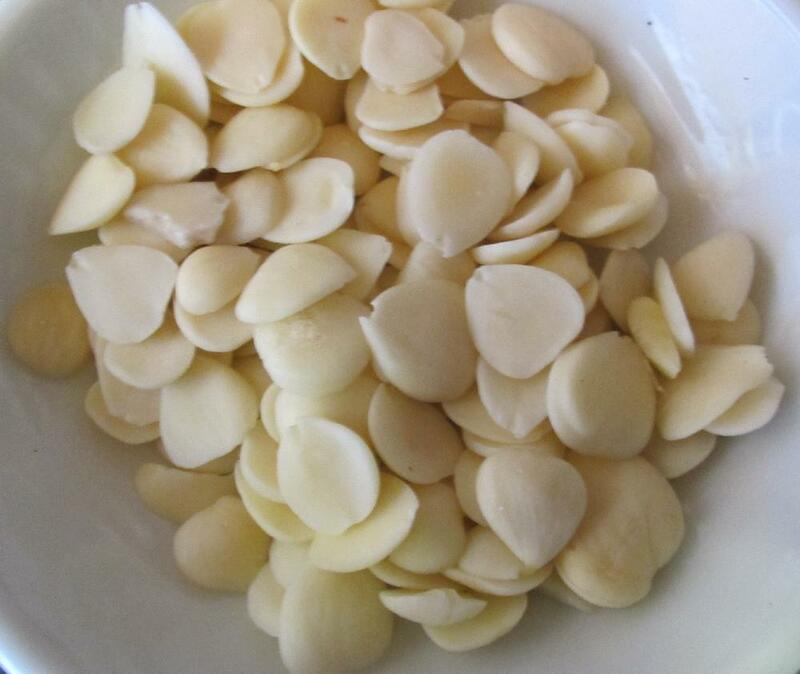 Like Polygonatum, it is often used to treat lung disorders. 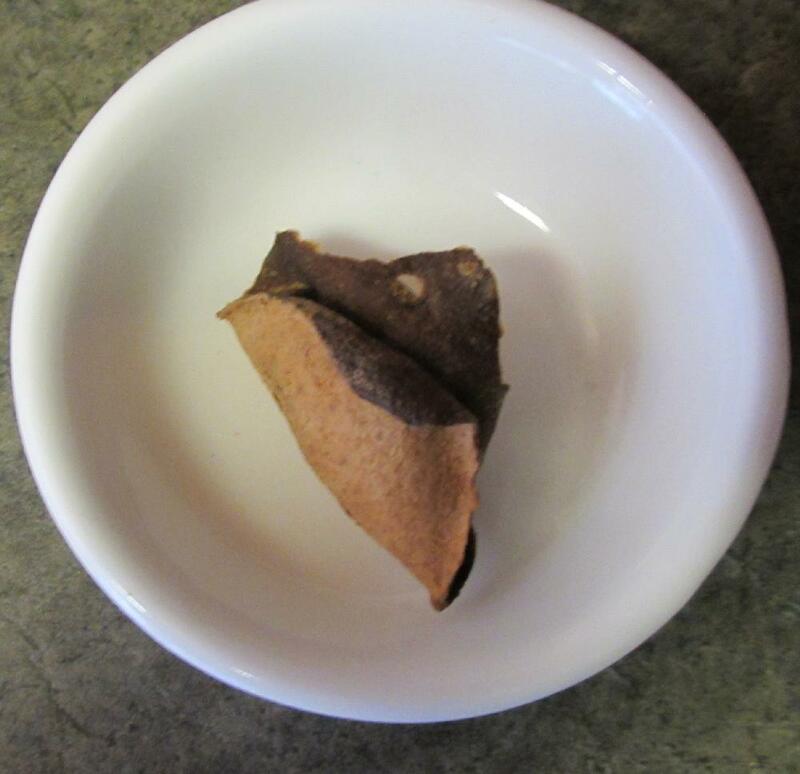 It is very difficult to chew and swallow when still in the dry state and has very little taste other than a slight woodiness. 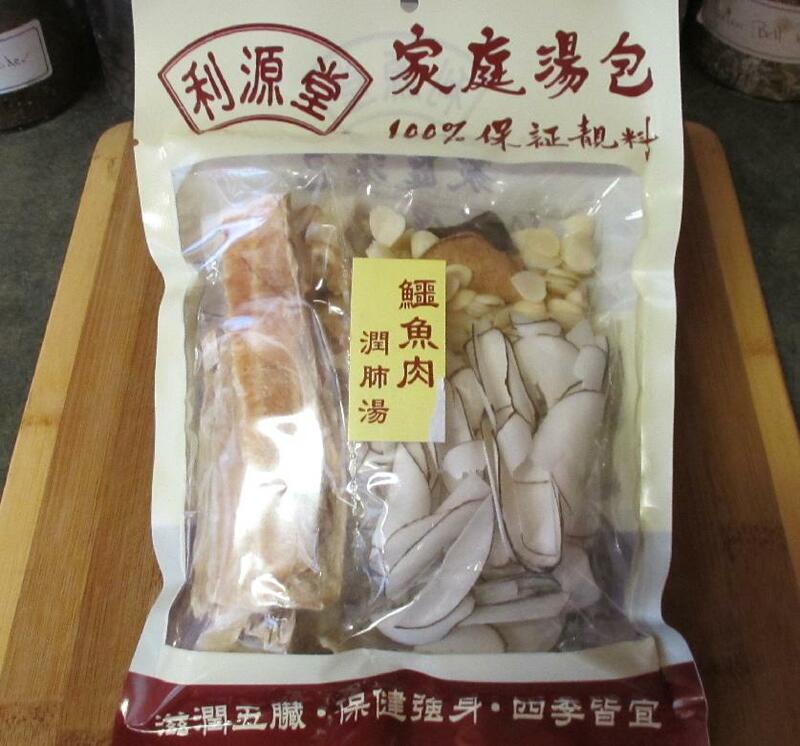 Preserved dates: The Chinese name for these is most commonly translated as candied jujube. 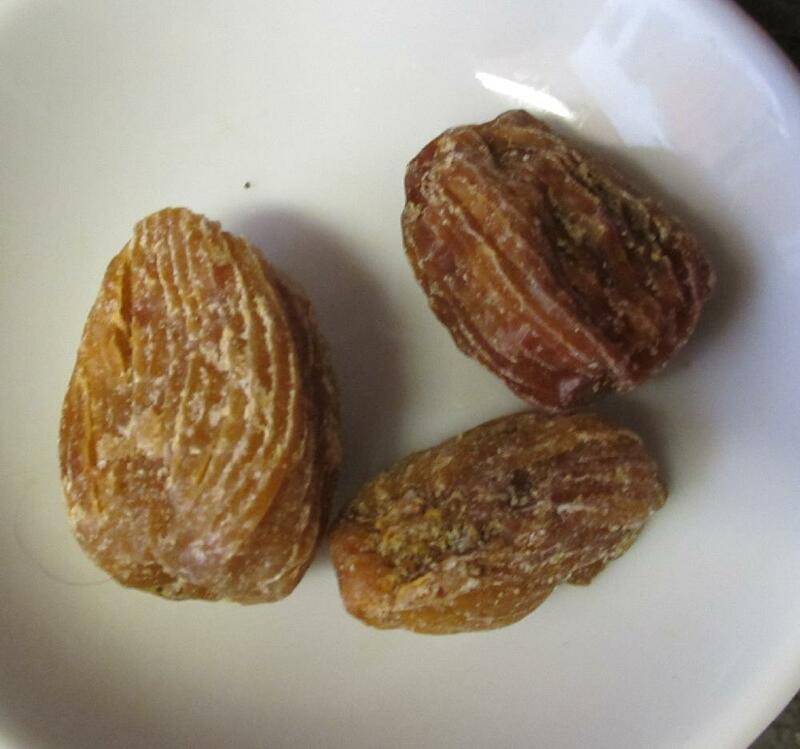 I have found various references to jujubes as being dried red Chinese dates but most pictures I came across on the Internet then gave a different Chinese character name and the appearance of those is much redder than you see here. These things do have the appearance of dates, however, so I assume this is just a different variety. Chinese dates are said to be good for a sore throat and apparently are used in some western pharmacological preparations. Apricot: Clearly, as you can see, these little things are most definitely not apricots. They are, however the seed of a particular variety of apricot grown in Asia and the Chinese name on the package translates as ‘southern apricot’. The taste is quite strong and is very like marzipan. 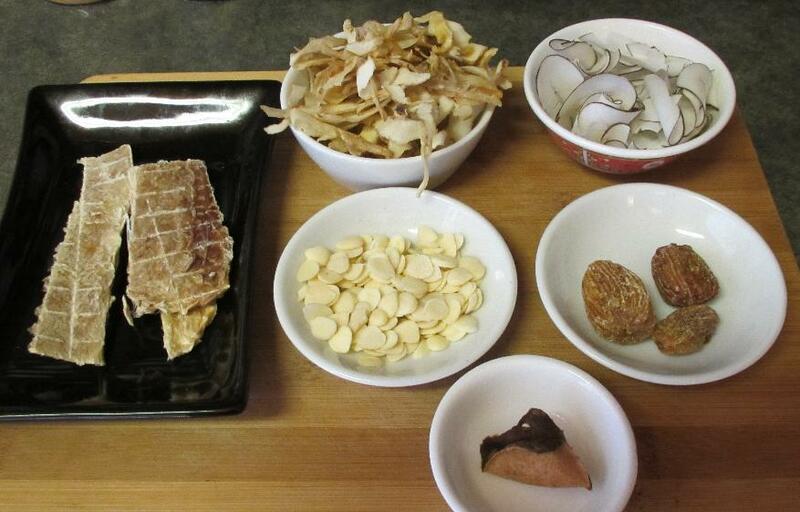 In fact, these seeds are also called ‘Chinese almonds’ and they are sometimes used, along with regular almonds to flavor amaretto and biscotti. Orange Peel: The Chinese name, 陳皮, translates as ‘old skin’ and can actually be the dried skin of either oranges or tangerines. It is a fairly common ingredient in both Chinese cookery as well as Chinese medicine where it has a variety of uses, including supposedly clearing up mucous. I am merely a novice student of written Chinese and I have to confess that translating the instructions on the back of this package really put my abilities to the test. There was one character in particular that I had a very hard time identifying and it caused quite a bit of confusion. 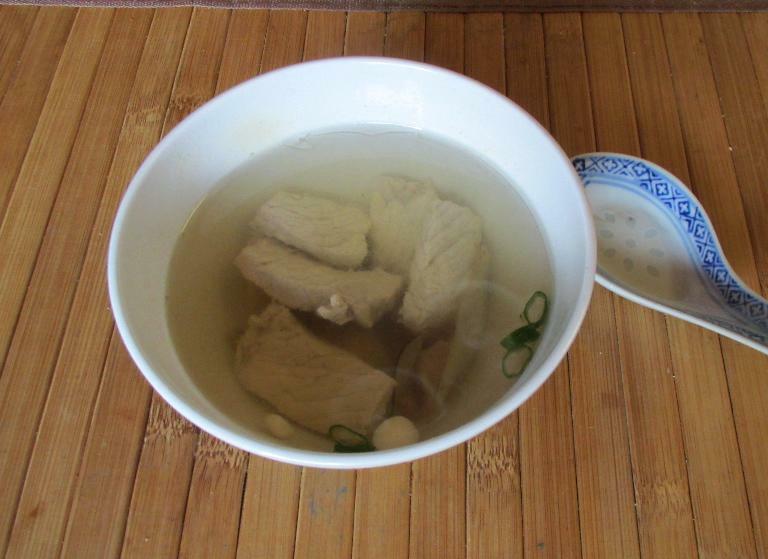 Soak Crocodile meat in cold water 15 minutes, and rinse the remaining ingredients. Measure 15 cups water into a saucepan, bring to a boil, put in all ingredients including (lean) meat, cook 2 hours, add salt to taste, serve immediately. 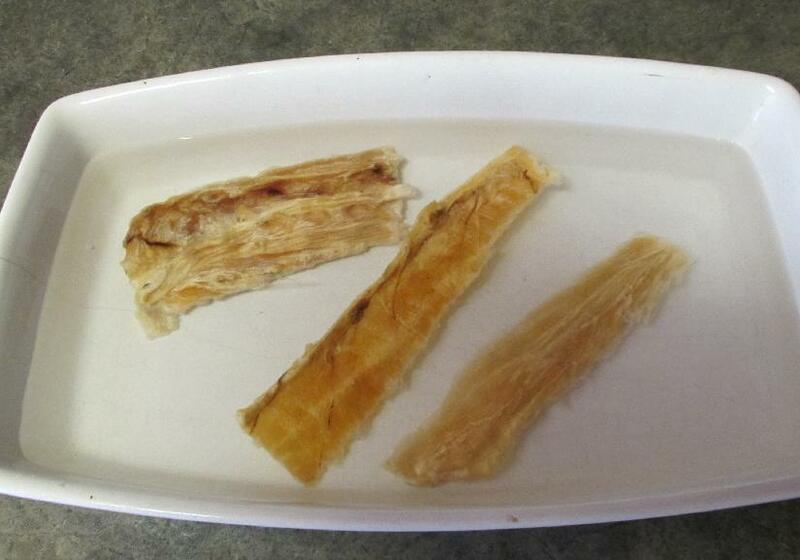 Above, you can see what the dried meat looks like after being soaked as instructed. Frankly, I cannot see why this step was required as the meat barely softened during this step and is going to get a good two-hour soaking in hot water anyway. This is the meat I used. It is very lean pork cutlet trimmed of the edge fat. 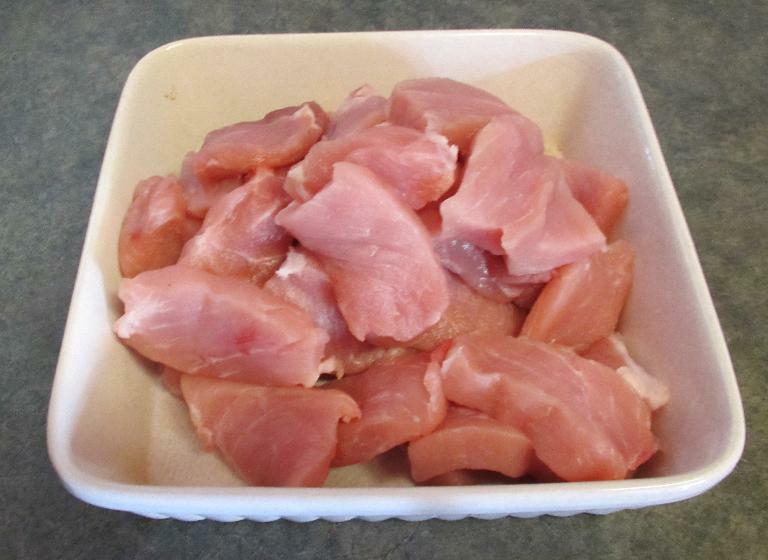 The instructions are silent as to how to prepare the meat and could easily require that it be put into the pot in a single chunk. In the absence of any direction, I cut it into fairly thick slices. I brought the water to a boil as directed and added the ingredients. I rinsed the dry flavorings as the instructions seem to indicate (this part of the translation was bit grammatically tricky for me), but, again, this step seemed a bit superfluous. Finally, I turned the heat down for the two-hour cooking period. The instructions use the characters ’明火’, which mean ‘bright flame’ so I took that to mean a bit more heat that one normally uses for soup and I kept it at a pretty vigorous simmer. This was surprisingly good – better than I anticipated, in fact – and both my wife and I enjoyed it. The broth was very light and delicate and not at all medicinal as I rather expected. The almond taste of the ‘apricot’ seeds was dominant and though I would never have thought that this would be a good taste in a savory dish it really went well with the pork. I did conclude, though, that the idea is probably that the solid ingredients be strained before the broth is drunk. The sea coconut was actually even harder to chew than when it was dry and some of the other ingredients were quite chewy and tough as well. The pork wasn’t too bad but it was very nearly at the point where it had given up its entire flavor. We still have quite a bit of the broth left and I think I may now strain it and maybe serve it with some scallion and perhaps another simple ingredient or two. Hi I suffer from COPD which is asthma, bronchitis, and pulmonary obstructive lung disease. I so badly want to get rid of the sticky phlegm that fills my lungs daily. Makes it quite difficult to breathe without feeling and some times hearing the rales in the lungs. Any way I was told that this soup is great for Asthma so I am going to give it a try. Thanks for your help in explaining the ingredients. I have seen these packets in China Town as well and believe me I don’t read Chinese writing. It smells pretty good when I am cooking it. When I was in Thailand I had Crocodile soup. But if you ask me it looked like beef and had about the same texture. I wonder did they use a different part of the crocodile and it was just one piece an inch cube. The rest was broth and some other little vegetables. It was quite the experience to go there. Hi Dlanor, do you have an email address I can contact you at?